Posted March 11th, 2018 by Mike Boyes & filed under Abnormal Psychology, Clinical Neuropsychology, Clinical Psychology, Health Psychology, Neuroscience, Psychological Disorders, Schizophrenia, Treatment of Psychological Disorders. Description: Schizophrenia affects about 1% of the population and while there are treatments that can be partially effective there is no real cure. An understanding of the origins of schizophrenia, of how it emerges, could move us towards earlier identification and could suggest new treatment avenues. As it has been discussed in our textbooks, schizophrenia is said to involve chemical changes in the brain and, over time, may also be associated with physical changes in the brain as well. An early speculative debate turned around whether the physical changes in the brain (loss of mass) occurred prior to the onset of observable symptoms or later, after the emergence of symptoms. The current view (see DeLisi et al, article in Further Reading below) is that the structural changes to the brain occur prior to the onset of symptoms. The article linked below talks about something that could contribute to this. 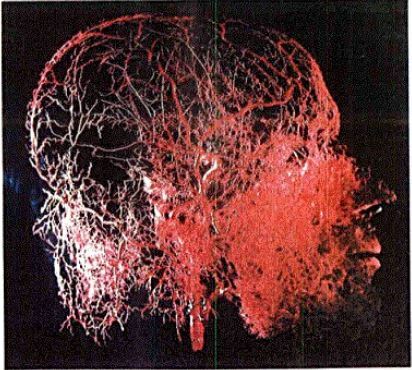 Specifically, the line of research reported upon suggests that brain molecules tasked with supporting the development of the vascular system (shown in the interesting, if a bit creepy, photo below), or angiogenesis, in and around the head and brain my systematically under-function in those who have or go on to develop symptoms of schizophrenia. What might some of the implications of these finding be for the identification and treatment of schizophrenia? Well read the article linked below and find out. Source: Looking for the origins of schizophrenia, D’Or Institute for Research and Education and ScienceDaily. When we consider schizophrenia in an introductory Psychology course we typically speak about the possible links between changes in neurochemical functioning in the brain (involving neurotransmitters) and the symptoms of schizophrenia. However, given the limits to the effectiveness of therapies aimed at adjusting the neurochemistry of those showing symptoms of schizophrenia it seems likely that this level of description will be insufficient. The study linked above suggests an interesting array of possibilities. If, for example, vascularization issues are part of the schizophrenia puzzle and differences can be seen in the angiogenic capacity of brain cells in those who do not yet show any symptoms of schizophrenia then an early detection opportunity may exist. It is not clear if this could also lead to an early treatment, but the possibilities are intriguing. In very general terms how might schizophrenia be viewed differently than other disorders like, say, depression? Why might issues in vascularization be important for a fuller understanding of the origins of mental disorders like schizophrenia? What might some of the treatment advantages be of very early identification of possible preconditions for the eventual emergence of symptoms of schizophrenia? Dietsche, B., Kircher, T., & Falkenberg, I. (2017). Structural brain changes in schizophrenia at different stages of the illness: A selective review of longitudinal magnetic resonance imaging studies. Australian & New Zealand Journal of Psychiatry, 51(5), 500-508.